The Scirocco coupe, which sells in Europe for 22,500 euros ($30,873), had a cult following in the U.S. during the 1970s and 1980s. BERLIN/WASHINGTON (Bloomberg) – Volkswagen AG may bring back the Scirocco coupe and Phaeton sedan to the U.S. as it aims to triple sales in the world's second-largest car market. “We will be looking for opportunities” to return the Scirocco to the U.S., Jonathan Browning, VW's U.S. chief, said Thursday in an interview in Washington. “We will reconsider bringing the Phaeton back to the U.S. in the next product cycle,” he said, adding that a decision hasn't been made yet. Volkswagen withdrew the 67,400-euro ($92,360) Phaeton, from the U.S. in 2006 after poor sales. The Scirocco, which sells in Europe for 22,500 euros, had a cult following in the U.S. during the 1970s and 1980s. VW targets sales of 1 million vehicles in the U.S. by 2018, including models by its Audi luxury unit, to close the gap with Toyota Motor Corp. and General Motors Co., the world's two biggest automakers. VW introduced a larger version of its Passat midsize sedan at the Detroit auto show in January, its first car built specially for the U.S. “We were very, very encouraged by the reaction,” Browning said of the new model. VW will open a factory in Chattanooga, Tennessee, by April and start delivering the new Passat, priced at around $20,000, in the third quarter. The carmaker closed a factory in Westmoreland County, Pennsylvania, in 1988. The Phaeton has never met the company's original sales target of 20,000 vehicles annually. The model, which came on the market in 2002, cost more than 1 billion euros to produce. VW produced 7,500 Phaetons last year, the carmaker said Tuesday. 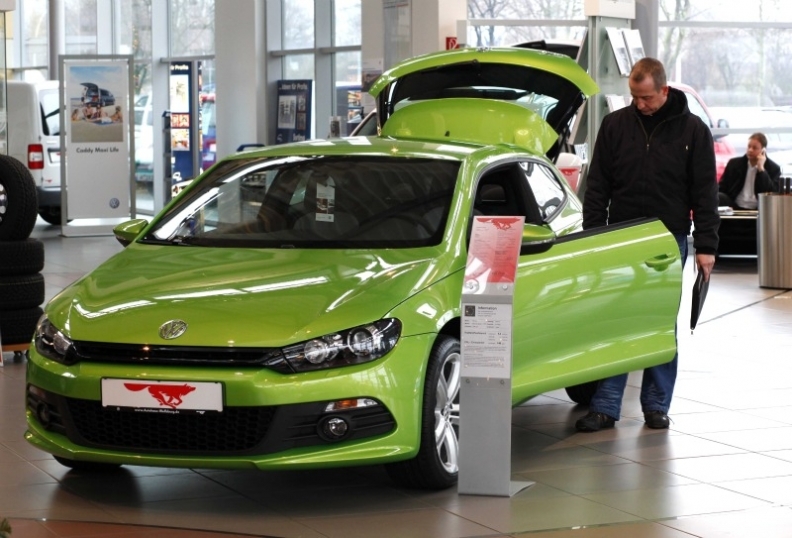 VW decided in 2006 to build a new version of the Scirocco. Almost 796,000 Sciroccos were sold worldwide between 1974 and 1992, when it was discontinued. VW has never sold the current model in the U.S.
Volkswagen is trying to boost sales by capitalizing on buyers' memories of popular previous models. The carmaker in 2006 brought back the Rabbit to North America, renaming its best-selling Golf model for the U.S. market. VW released a new version of the Beetle in the late 1990s. The model is built in Mexico, primarily to sell in North America.